Reservoir hydraulic structure to accumulate and store water for the purpose of its artificial redistribution. 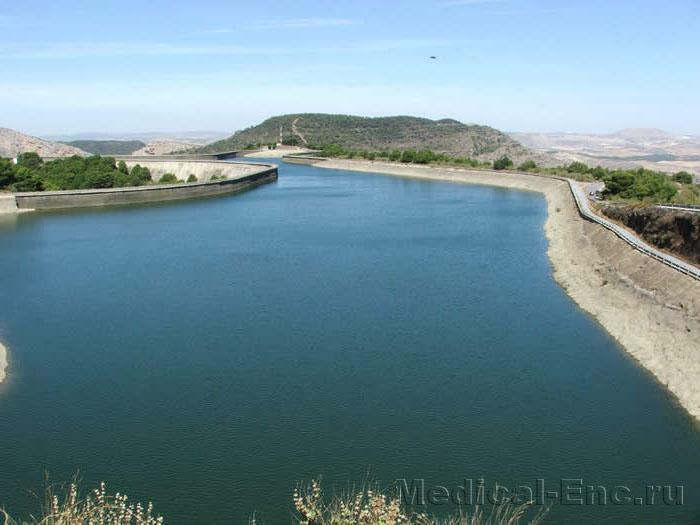 The reservoir created on navigable rivers to maintain the required depth, hydropower or irrigation use of the reservoir, as well as for industrial and drinking water supply. For utility and drinking water supply is advisable to use long reservoir with water exchange a few times a year. However, in the long-term reservoirs accumulate sediment, organic parts of which are developing anaerobic processes and increases the number of bacteriathat reduces quality of water. Therefore it is necessary that water discharge devices allow for the sharing of water in the bottom layers (bottom waterways). Large sanitary is the provision of the bed of the reservoir (demolition, removal or disposal of waste, removal of tree plantations, protection from erosion of cemeteries and the burial sites)reducing to a minimum the number of substances that contribute to pollution of reservoirs and multiplication of germs. When using the reservoirs for drinking water supply the coastal strip of a width of 100 to 200 meters it is advisable to green up mostly of coniferous species (see Zone of sanitary protection). Special attention should be paid to the prevention of pollution by sewage of industrial enterprises and ships (see Sanitary protection of water bodies). A reservoir is an important hygienic factor that changes with climatic and meteorological conditions over large areas, but at the same time, it is inevitably linked with changes in the epidemiological situation. The reservoir can be a place emergence of Anopheles mosquitoes, so even in the construction project must be provided anti-malaria activities, activities for the prevention of tularemia, seasonal encephalitis, tick ricketsiosis and parasitic diseases.